Notoriously expensive and often unfairly shunned by budget travelers afraid of getting fined, tiny Singapore is a modern-yet-green city/island/country well worth a visit for the food, mega-mall shopping, and unique blend of cultures. Don’t assume that Singapore is all about concrete shopping blocks! You’ll find ample green space and an impressive system of elevated biking and walking trails that interconnect city parks. 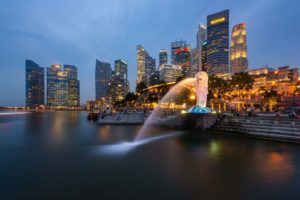 Yes, Singapore costs far more than neighboring Malaysia or the rest of Southeast Asia, however, the city has a pleasant vibe, lively Indian and Chinese cultures, speaks good English, and is pleasant enough just to stroll. You could spend months living in Singapore and still discover hidden places and eateries the guidebooks have missed! Even the museums in Singapore will remain in memory forever.